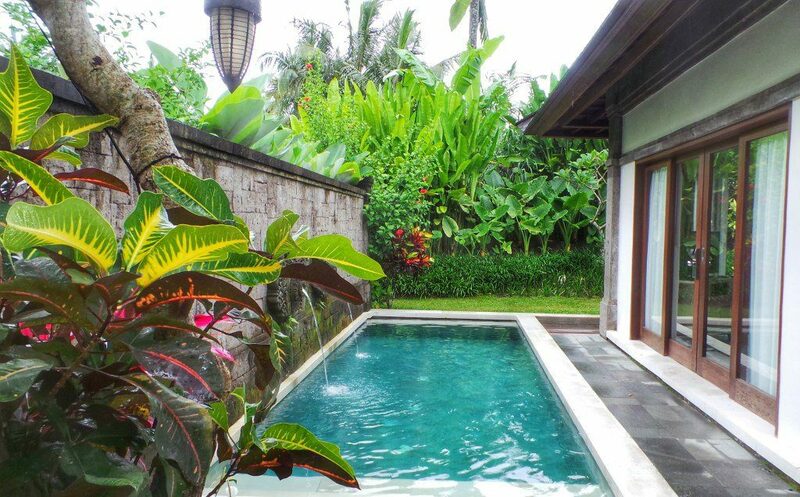 The Desa Visesa Ubud is unlike any hotel I’ve ever visited. 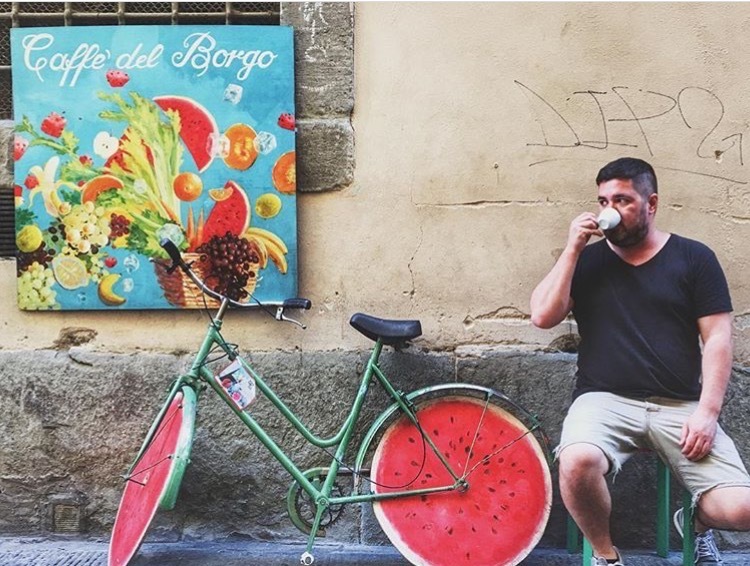 The hotel is actually part of an authentic, functioning traditional village. 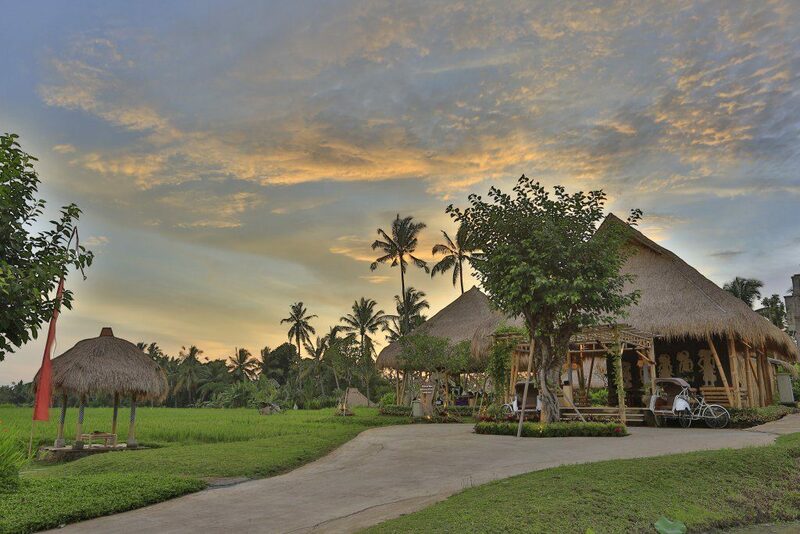 The village is surrounded by lush green organic rice paddies, and staying in the village allows you to glimpse authentic Balinese life even as you enjoy all the comforts of a high end property. I was immediately impressed when I entered the property. 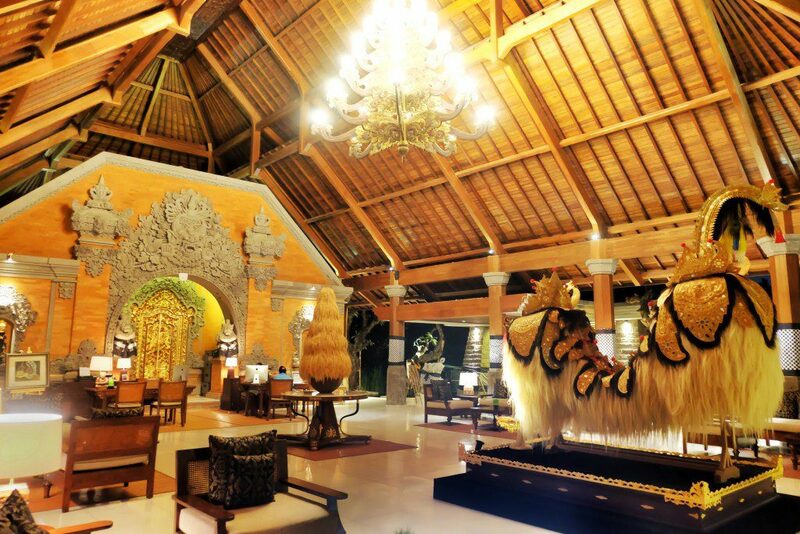 The expansive lobby is designed in a traditional Balinese style and features local art throughout. The staff greeted me with a welcome drink and welcomed me to the property with a traditional Balinese blessing. Next, they explained the layout of the property and provided me with a short tour on a chauffeured golf cart! The grounds are beautiful — lush greenery throughout. As we cruised along checking out the grounds, I felt peaceful and serene, almost tranquil. There is a sense of calm and quiet throughout. 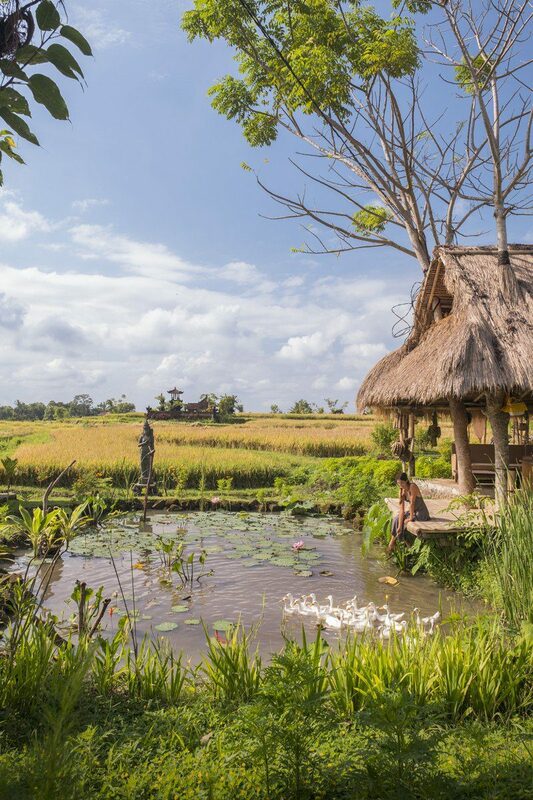 Being situated in the rice paddy adds to this peacefulness but also provides an incredible backdrop for some gorgeous photos. The Desa Visesa has several room types, and management was nice enough to upgrade my room to a suite with a private attached pool. Having my own pool was an immense luxury, and I’m afraid it will be difficult to ever stay in a room without a private pool again. Besides the pool, my other favorite part of my suite was the indoor/outdoor bathroom. I love this concept and wish that it was more common at home. While the air conditioned room was inside, much of the bathroom was outside, including a huge soaking tub you could relax in while listening to the rain. Other room types available at the hotel are larger units, allowing families to share multiple villas with a communal pool. 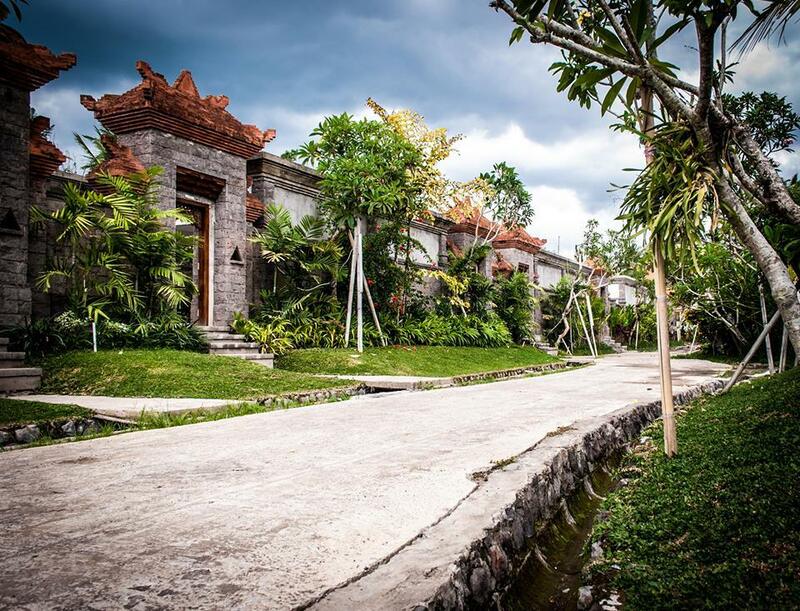 The Desa Visesa is the type of property that’s difficult to leave once you arrive. I strolled around checking out the grounds and learned about the permaculture program. 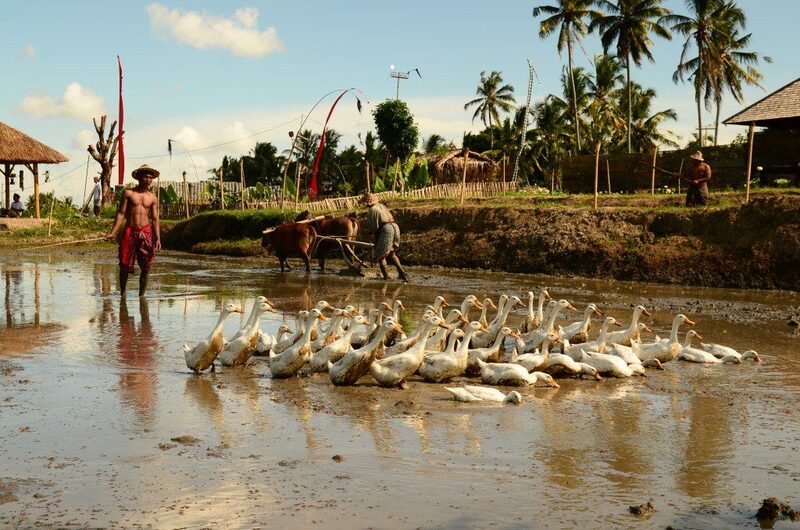 The initiative pursues complete sustainability and self-sufficiency on their organic farm. Workers tend to the farm, which also provides jobs for the community. 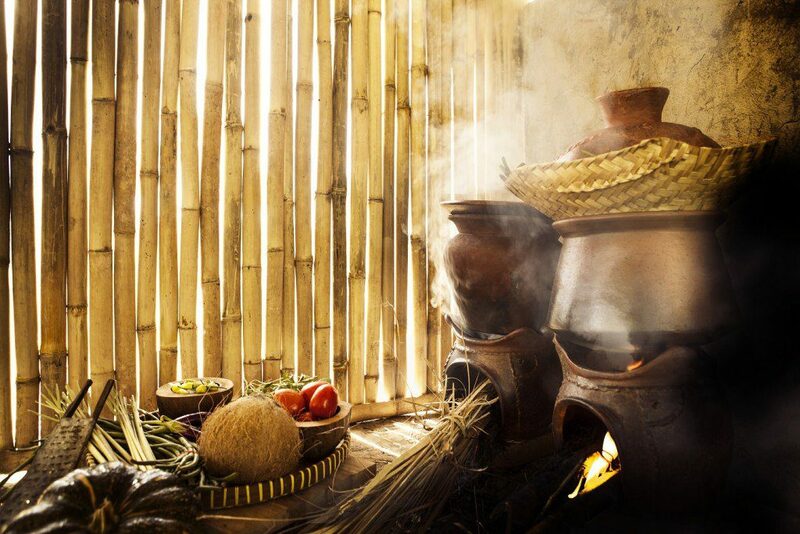 You’re even able to pick your own vegetables and have them prepared in a traditional Balinese cooking method that uses charcoal as the heat source. 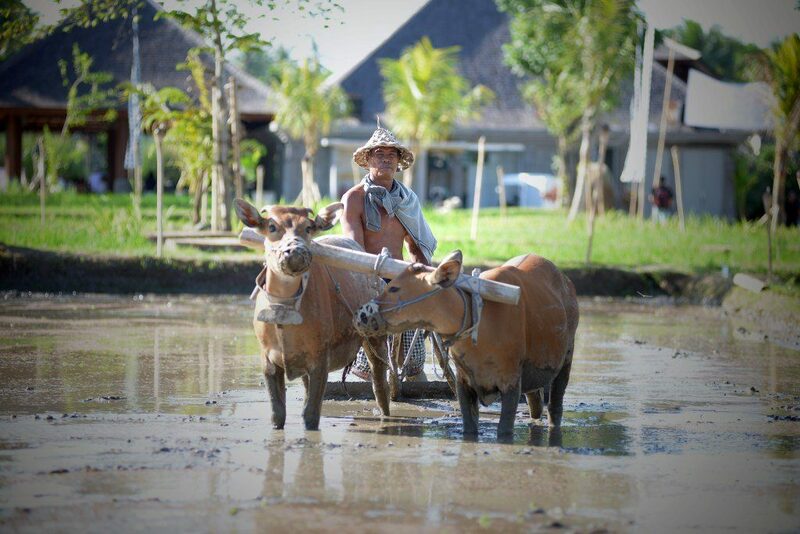 Other projects offered by the Desa Visesa allow you to experience local life with the villagers. Throughout the day, you can participate in multiple programs that teach you how locals care for animals and work the land. The hotel offers a daily breakfast buffet for guests. 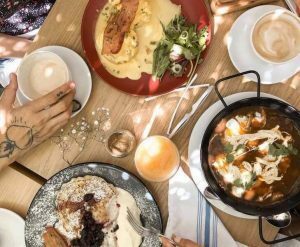 Made to order choices such as omelets and waffles are served alongside ready to eat international options with a variety wide enough to please everyone. The breakfast was good — standard fare, but very good. I most enjoyed the lunch I had during my stay. The menu had many choices, but that day we were in the mood for seafood. 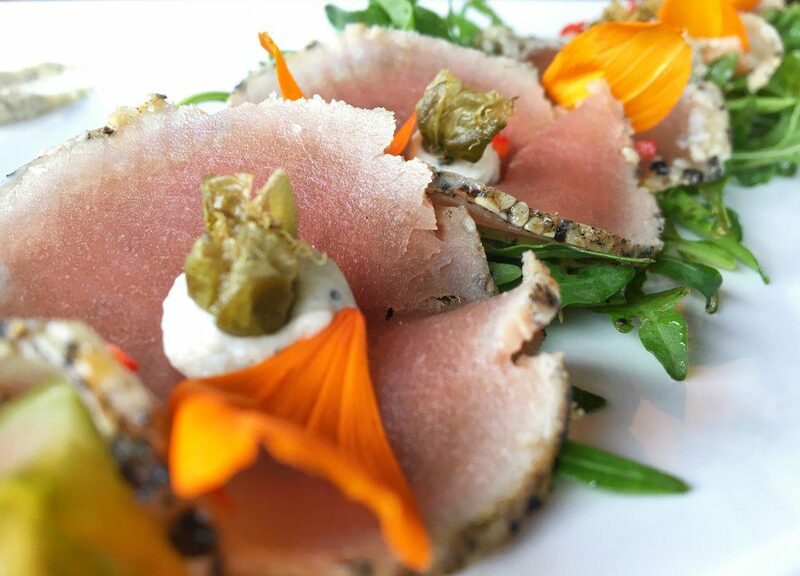 The seared tuna appetizer was the perfect light but flavorful start to the meal. 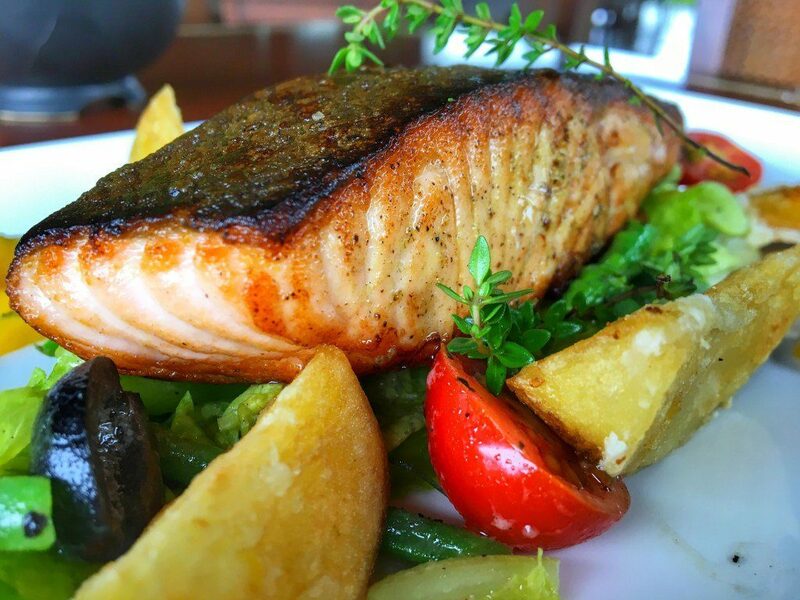 The roasted salmon and vegetables were perfectly cooked, and I loved that the chef seared the fish before finishing it in the oven. We finished with the mixed seafood noodles. 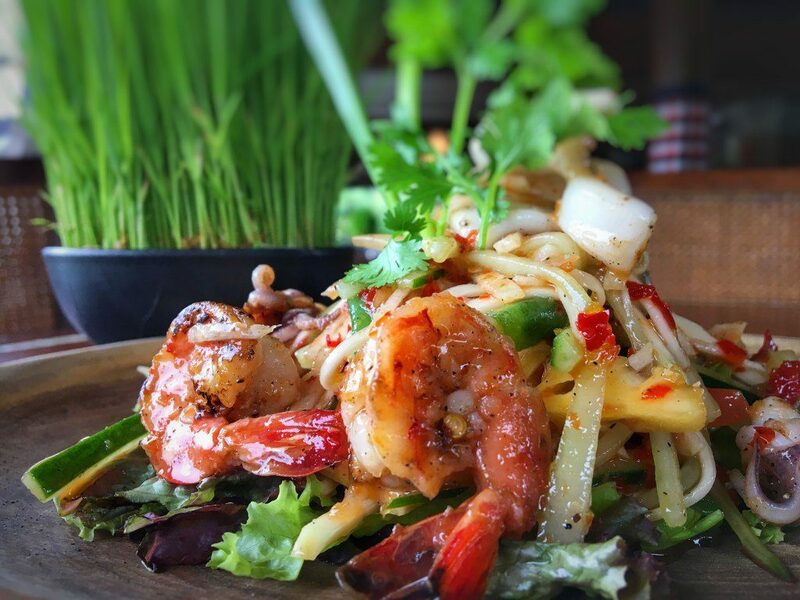 The large portion was delicious and full of seafood — a great shareable dish. The one area I unfortunately didn’t have time to visit was the spa. There, a natural healer will consult with you to determine which treatment is best for you. Many of the spa treatments take place inside a man-made cave and incorporate medicinal herbs, plants, and spices. The treatments center around the five elements, with different cave rooms focusing on each element. This is definitely one reason I might return. I can’t finish the article without mentioning the staff. The staff are truly incredible — some of the best I have ever had the pleasure of meeting. The staff at high-end properties are nearly always phenomenal, but the employees of the Desa Visesa go above and beyond. So much of what made the experience amazing had to do with the staff. What looked best to you? Let me know in the comments section below! 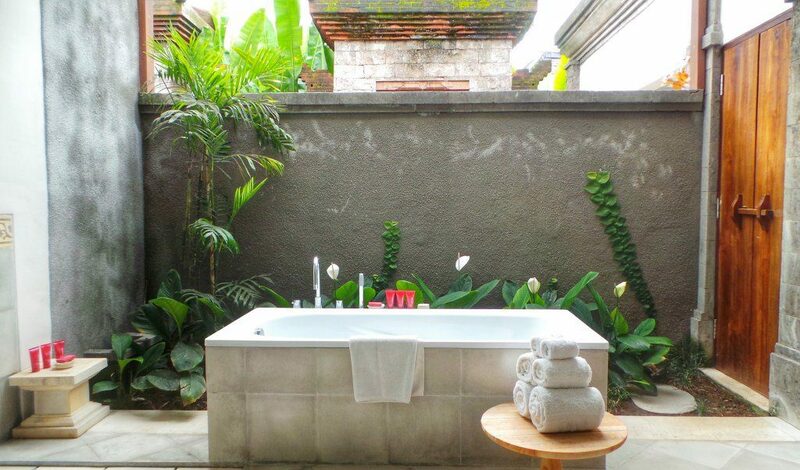 To book your own stay at the Desa Visesa visit their website by clicking here or through Booking.com. Disclaimer: I would like to thank the hotel for having me as their guest during my stay. All opinions remain my own, as always. This post includes affiliate links. Using these links helps support the blog at no additional cost to you. I can’t decide what looks best, the food or accommodations. I love how you’re part of the culture – meaning everything is blended in and assimilated vs just a modern building starkly contrasted with the area. That seared ahi looks amazing!! It was a toss up between the food and the accommodation for sure. Honestly, this property does everything well. Also– their customer service is as good as the food or accommodation. This place is a 10 out of 10. 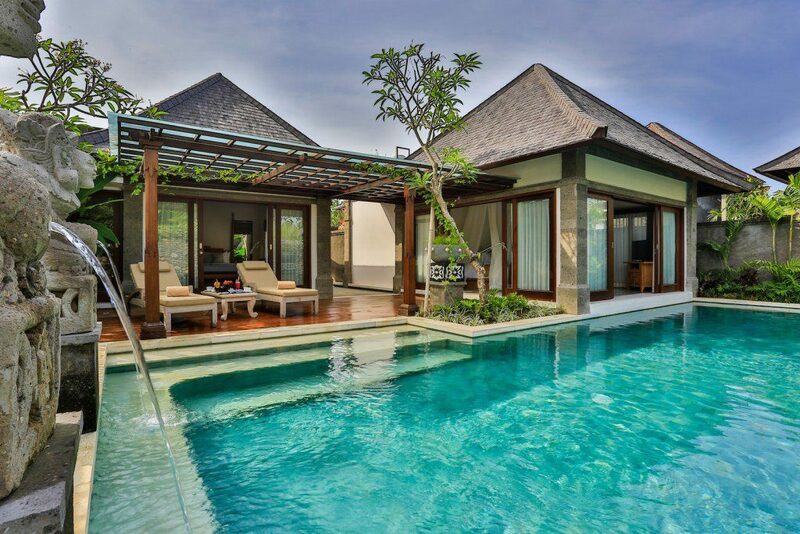 Upgrade to have a room with a private pool!! Does life get better? Looks like an awesome place buddy. It was definitely hard to leave! I’ve only had a private pool a few times and it’s definitely such a luxury. I didn’t want to leave for sure. The suite, the food, the staff– everything was so great. I really recommend this property! This hotel is so impressive! 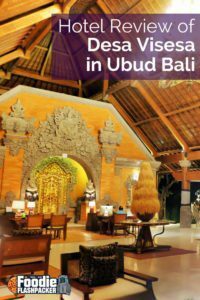 The rooms are so luxurious which is kinda unbelievable when you think this hotel is part of a traditional Balinese village! And the food looks incredible! 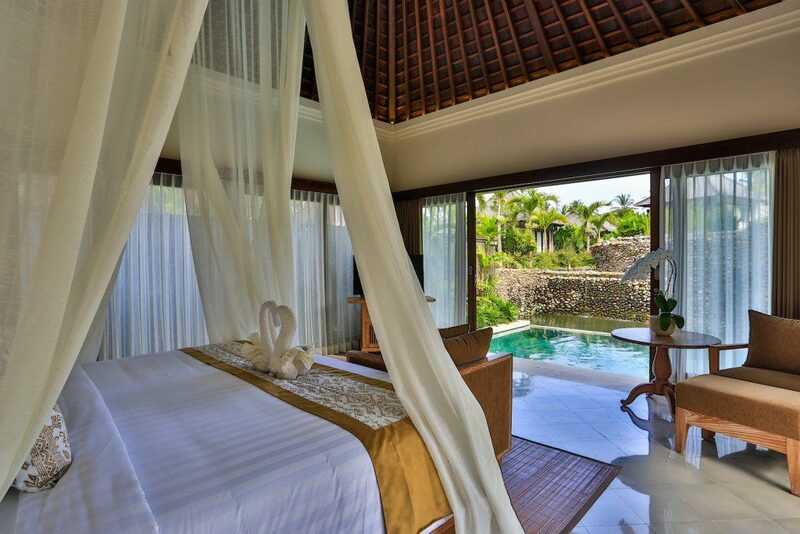 I’ll add this to my list for potential hotels when we are next in Bali! I hope you get to stay there. The property is really amazing. And yes, I love that you can experience a local village and then have the features of a high end property when you return to your room. I have to agree with you the swimming pool and the outdoor bathroom are the highlights of the room. Such an amazing hotel it is so unique to be part of the village too. For sure- I love the outdoor bathroom. I wish they were used more in the states, where I’m from. It’s such a nice concept. I agree! It was a great mix of both worlds. I hope to go back soon. This place looks magical, love your pictures. Anywhere with it’s own private pool, good food and a beautiful view is a win for me! Anita Hendrieka recently posted…Pinterested in Growing – The Ultimate Pinterest Course for Bloggers and Small Business Owners! This place was a winner for sure. I cannot wait to go back. As amazing as this place is the staff takes it to the next level. The service is incredible. I love how it’s so luxurious (totally my style) but you’re in an authentic village. You get the best of both worlds it sounds like! The indoor/outdoor bathroom is so nice! This is truly paradise. Omg, and the food. Wow, I’m definitely bookmarking this for the future. Okay, this place is beyond beautiful. Those dining options look pretty epic too. I’m a chef so I appreciate GOOD FOOD when I travel 🙂 Thanks for putting this hotel on my radar!